Our truck was hit by a car. The move ahead of you has the elevator and is running late. And you both must be out by 5 pm. Luckily, everything went well and no one was injured in that snow-and-ice-induced fender bender. 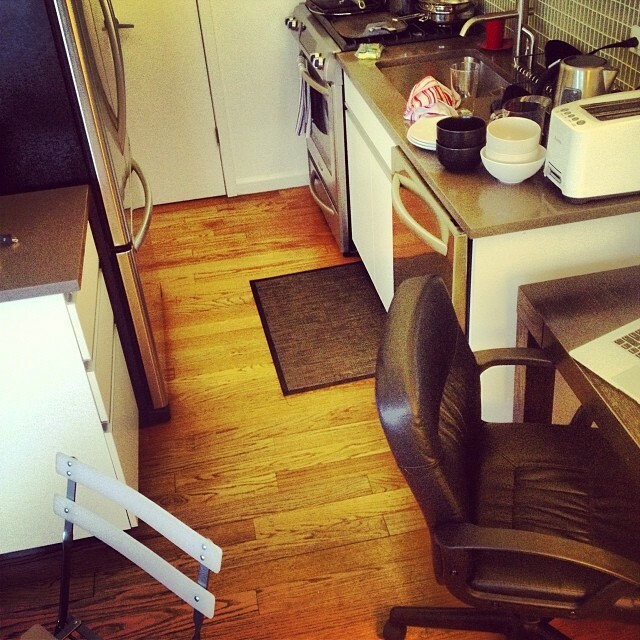 I’ve mostly unpacked and am figuring out where everything goes in the kitchen. Also, how the oven – my first convection oven – works. I don’t yet have a place to store my pots and pans, and most of them are piled on my desk which is actually in the kitchen. Which means I’m typing on the sofa. Cooking has been pretty simple. The first non-delivery dinner I “made” was defrosting some lentil soup I had made last month in my own place. Soon, I hope to be cooking and baking for real. 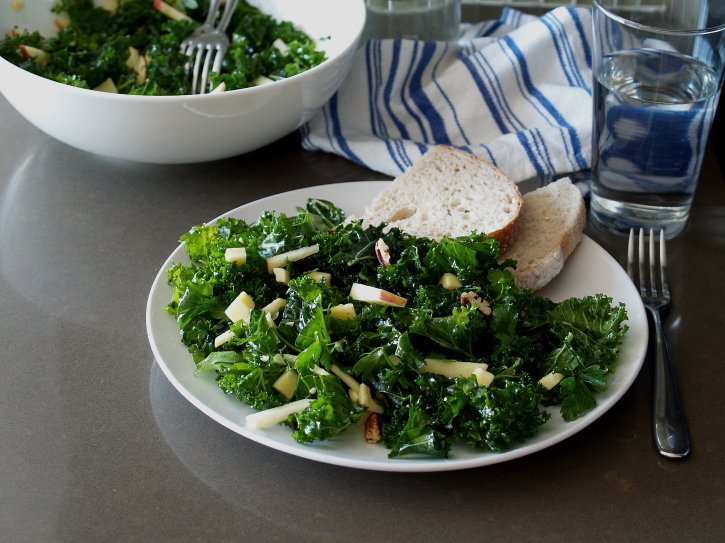 Until then, I give you kale apple salad. On my kitchen counter. Not really a recipe, but one of many variations on the kale/fruit/cheese/nut winning salad combo. Tear several handfuls of kale (I used curly kale) into bite-sized pieces, discarding the thick ribs (or put them aside to sauté). Use your hands to toss the kale with olive oil and let sit for about an hour until the kale softens and wilts a bit. Lacinato kale will wilt faster. If you don’t have time to wait, microwave the oil-slicked kale for 30 – 60 seconds until bright green. Slice half an apple into thick julienne slices. Cut aged cheddar into cubes. Toast a handful of chopped pecans. Mix the apple and cheddar with the kale. Add lemon juice (about half the amount of olive oil) and salt. You may need to add a bit more oil. Sprinkle with torn parsley leaves and pecans. It’s well past midnight and I’m sitting in a boxed-up apartment, unable to finish packing and unable to go to sleep. The bookshelf is empty, the furniture sold or given away, the art propped against the wall. It must sound funny to you that I’m about to wax nostalgic about an apartment that I’ve lived in for a mere handful of months. But I will. And I hope you’ll indulge me. 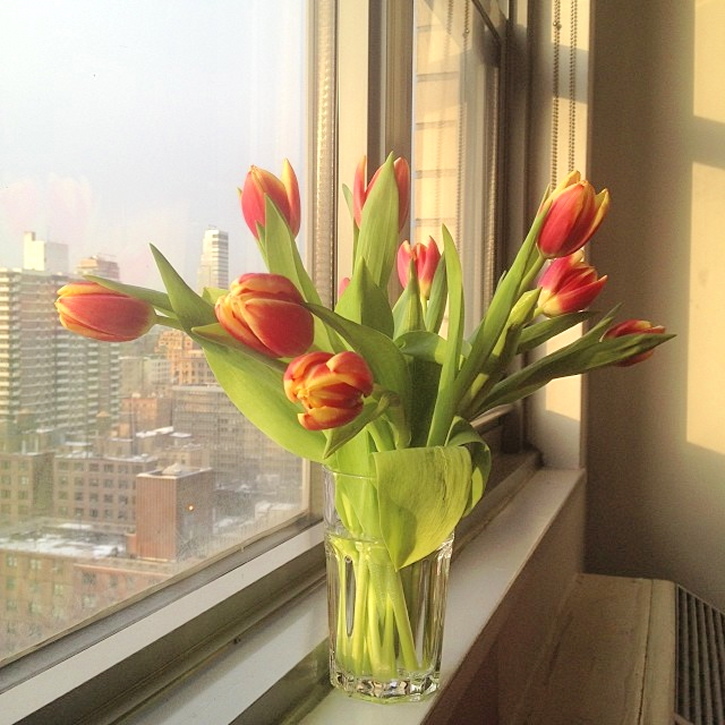 4F is Julie‘s apartment and has always been a vortex of social gathering. It’s located in a complex of buildings spanning three square blocks and surrounding an outdoor space, now more concrete than green, that we came to call Melrose Place for its centrality to dozens of friend and the high probability of running into one of them on the way home. 4F faces that urban courtyard of sorts and from its fourth floor perch, you can take in the comings and goings. Julie’s place is where we gather for shabbat. For leftovers. For birthday partying. For pre-partying. For hey-I-made-too-much-soup-so-come-over. For I’m-coming-into-town-and-need-a-place-to-crash-tomorrow. 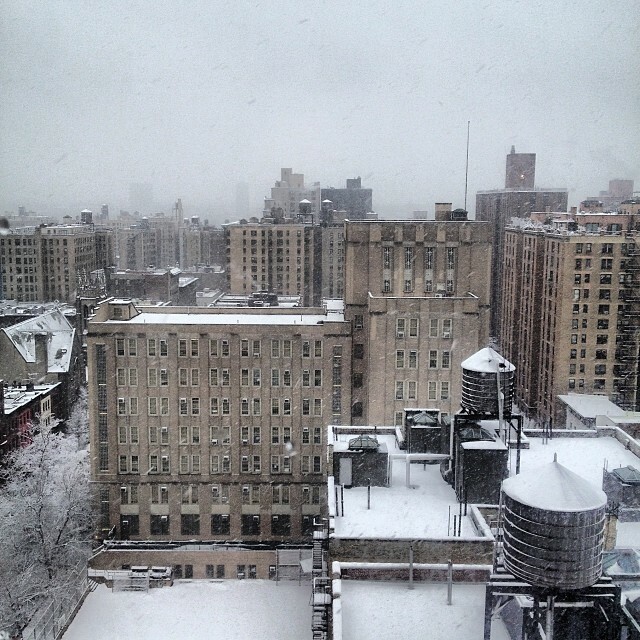 I moved to New York after graduate school knowing no one. 4F is where I made most of my friends. This time around, after five years in Boston, I took over Julie’s lease for a few months. That was in October. When I carted my suitcases of clothing and boxes of too-heavy pots into 4F with an air of uncertainty about the future – my future – I felt welcomed immediately by the comfort of Julie’s home. The lease ends tomorrow and Julie came over this morning to pack up more of her stuff. In between knocks on the door and visits from neighbors, I slid a batch of granola into the oven. I’ve been slow to jump on the homemade granola bandwagon. That all changed when, just a few days into the new year, I went to dinner at Eleven Madison Park – a restaurant about as far a cry as you can get from granola’s hippy-dippy connotation of my youth – and they sent me home with a jar of their house-made cereal. 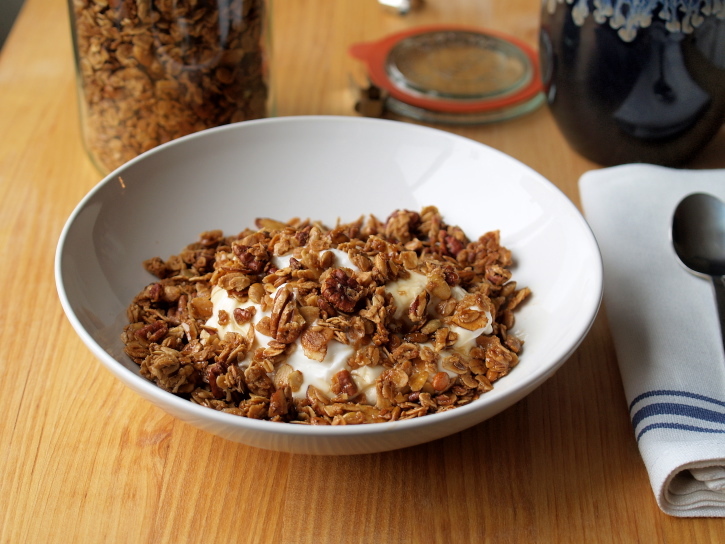 The next morning, I showered EMP’s granola over plain yogurt, tasting the embodiment of hospitality as dinner extended to breakfast and the meal continued from the restaurant into my own kitchen. I was hooked. The scent of maple and toasted pecans linger as I continue to sit here – so well past midnight that it’s more morning than night, really. I have a jar of granola ready for Julie to pack up when she comes by tomorrow. I mean today. As for 4F, it’ll be in good hands. My friend Jessica is moving in later this month. The old joke goes that that Jews say goodbye without leaving and I’m no exception, so rather than letting this elegy to an apartment go on and on, I’m gonna ghost. 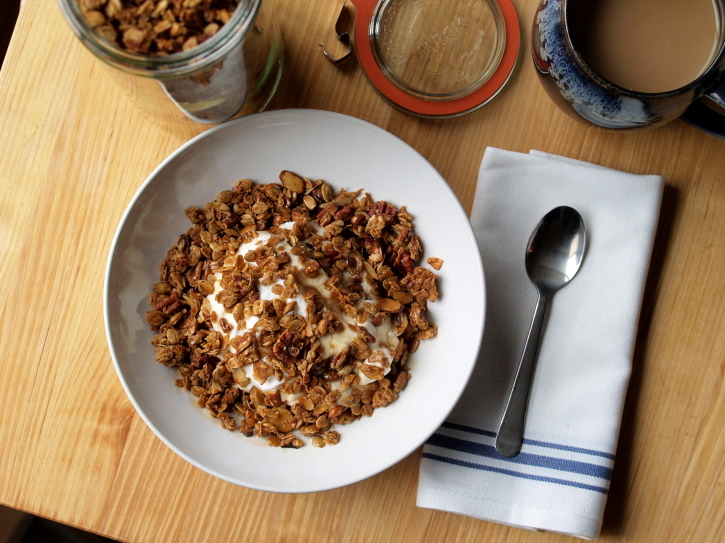 This recipe is a hybrid of Eleven Madison Park’s granola and Megan Gordon’s general granola guidelines. The flavors are inspired by the most breakfast-y scones I’ve ever made. I recommend throwing a big handful atop a bowl of plain Greek yogurt drizzled with maple syrup. Also, it’s not so bad with vanilla ice cream. Just in case you were wondering. There is a fair amount of salt in my granola, which may not suit everyone’s taste, so I’d suggest starting with only 1 teaspoon for your first batch. If you like your granola clumpy, don’t stir it while it’s cooking. And if you like it really clumpy, add an egg white to better bind everything together. Prep. Preheat oven to 300ºF. Line a large baking sheet with parchment. Mix. In a large bowl, mix together the oats, nuts, and seeds. Warm. In a small saucepan set over low heat, warm the sugar, syrup, olive oil, and salt until the sugar has just dissolved, then remove from heat. Mix again. Fold the liquids into the mixture of oats, making sure to coat the dry ingredients well. Bake. Spread the granola in a thin layer on the baking sheet. Bake for 35-40 minutes, checking and stirring the granola every 10-15 minutes. It’s ready when the oats have darkened to a golden brown and the mixture is no longer sticky. As the granola cools, it will harden. Store. 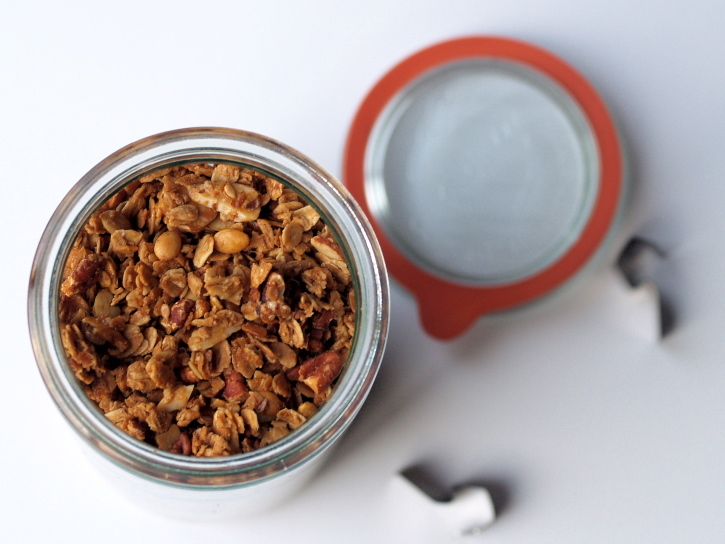 Allow the granola to cool to room temperature and transfer to an air-tight container. It should keep for about 10 days.